More on Ally later. 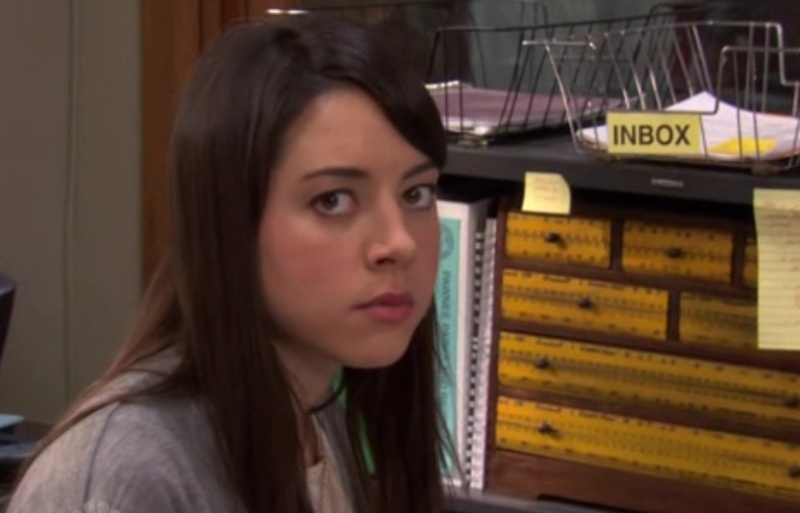 Let’s talk April Ludgate, our fictional fashionable hero of the month. Really, this is just an excuse to watch one of my favourite shows and call it research. April has perfected the Art of the Bitchface. It’s part of her charm. Well, charming to me. It’s a face I perfected while working as a temp in places such as the Company Whose Acronym Stood for Nothing (CWASN) or The Most Depressing Mall in the World. Unlike April, I was actually good at my temp gigs, in spite of working on my bitchface. 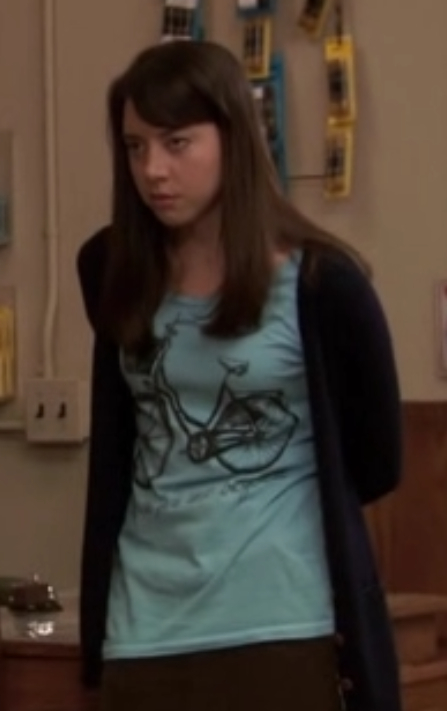 Let’s take a quick peek at crappy screenshots of April’s style from a recent episode and see if we can’t figure out how to do it ourselves. Without a costume department. Adorable, n’est pas? Given my druthers, I’d totally dress like this all the time. I’m probably a little old to wear a skirt that short, but I’m sure I could find something age appropriate in length. Sadly, not office appropriate. Not even if you add the cute boots. 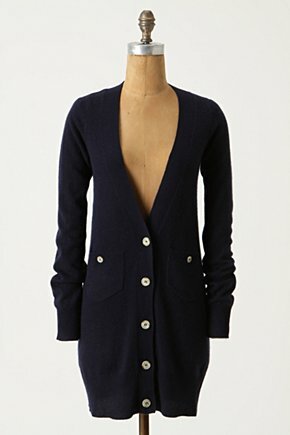 Anthropologie may as well advertise itself as home of the slightly oversized, yet totally perfect cardigan. I hit the jackpot on that one and had multiple cardigans to choose from. The Urban Outfitters skirt wasn’t exactly what I wanted, but it’s close. 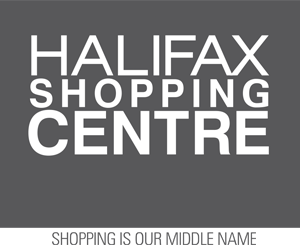 I think you could easily shop around and find something similar. Probably at the Gap. The line is straight and it’s as short as you can wear it without looking trampy or like you wish you were still 20. 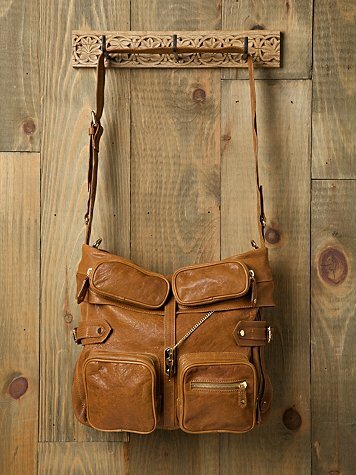 Accessorize with a really great slouchy, leather bag you can wear messenger-style. The bag I found kind of breaks the bank at $700+, but I was going for what looked the most like April’s. 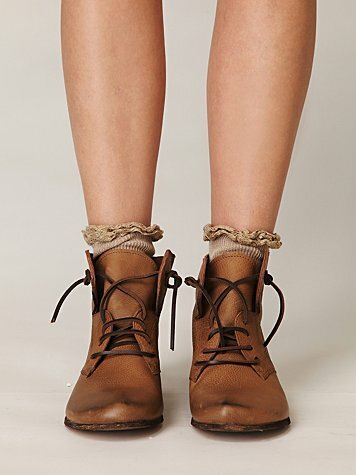 I did find others that were slouchy and cute for far less than that. Finally, the t-shirt. I saved this for last because I actually had trouble finding the right t-shirt. 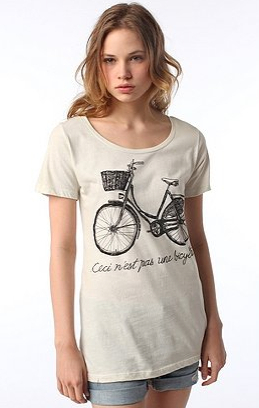 I guess bicycles screenprinted on t-shirts are not the rage right now. I did find the same t-shirt, but it’s all sold out at Urban Outfitters. Wonh wonh. 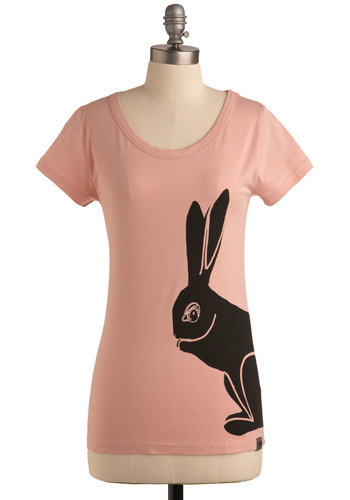 Honestly though, ModCloth is some kind of graphic tee heaven. 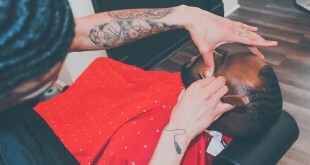 You could shop their t-shirt section blindfolded and probably come out with something cute. And depending on the season, Urban Outfitters can be the same. Like this sweatshirt. 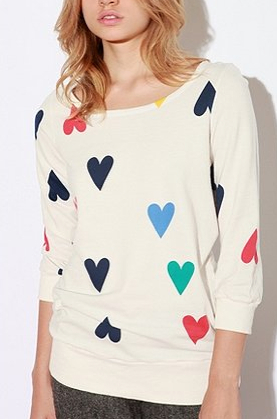 It’s all kinds of adorable and 100% the kind of top you’d see April Ludgate wear. It looks like something I owned when I was eight. And I would like to own it again. Here’s hoping that it’s still in stock in 104 days. And that I get a job immediately upon graduation. 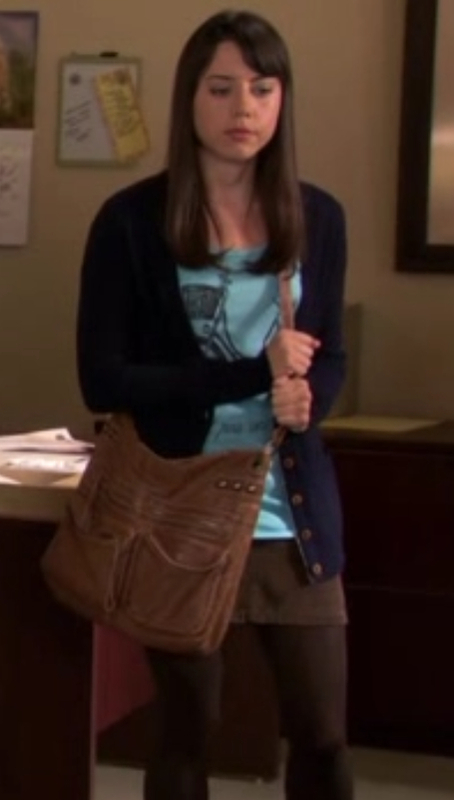 Because I totally want an April Ludgate inspired outfit for my weekend wear and new outfits require pay cheques. And now, for something completely unrelated to the content of this post, but as a means of cheering up Ally, who appears to have developed some kind of daycare induced plague (on top of being a busy beaver at work), here’s some Taylor Swift. Yes, that’s how much I love Ally. I’m watching Taylor Swift videos. And writing epic run-on sentences. 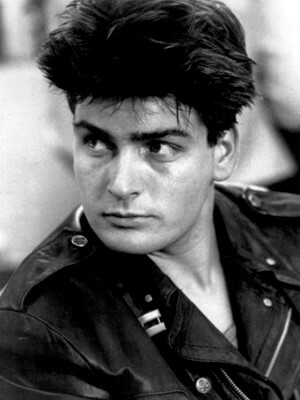 (okay, I’ll admit it…Ally might be wearing me down and I’m developing a soft spot for Swifty. I’ll never like country, but I might become okay with the Swift).